The Internet has extraordinary power to shrink the world -- to allow people separated by thousands of miles to more easily interact, learn from one another, and trade goods and services. These interactions are possible because of the incredible amounts of data that flows seamlessly across borders. We know these data flows are happening and we know they are having an increasingly significant effect on the economy. However, solid statistical foundations for measuring the economic impact of cross-border data flows do not currently exist. What’s needed is the sound methodology and standard nomenclature that other economic data enjoy, so that policymakers can make informed decisions and businesses can choose strategies that will help them grow. Late last year, the Commerce Department’s Digital Economy Leadership Team initiated a six-month effort to better understand data gaps related to measuring the economic value of the free flow of information across borders. This effort included meetings with over 30 stakeholder groups from the private and public sectors, a literature review, and a roundtable discussion convened on May 9, 2016, to discuss measurement gaps. The Commerce Department’s Economics and Statistics Administration  (ESA) and the National Telecommunications and Information Administration (NTIA) led this effort and have documented their findings in a new report, Measuring the Value of Cross-Border Data Flows . 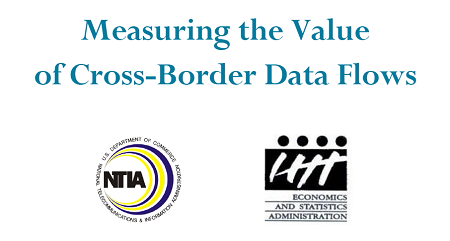 This report explores challenges in assessing the value of cross-border data flows and makes recommendations for how the Commerce Department and the private sector can improve measurement and analysis. The report highlights some of the efforts to better measure these flows and the larger digital economy that are already underway at the Commerce Department. For example, the Bureau of Economic Analysis  (BEA) is taking steps to improve its trade in services statistics to allow for more precise measurement of services that can be traded using information and communication technologies. Additionally, BEA and NTIA are embarking on a three-year study to define the industries and commodities that compose the digital economy to provide initial estimates of its contribution to GDP. As we begin to move toward implementing these recommendations, we will continue to collaborate with other governmental agencies, as well as the private sector and non-governmental groups, to improve our understanding of cross-border data flows. The Commerce Department is committed to providing businesses, policymakers, and other stakeholders quantifiable evidence of how cross-border data flows are affecting our economy so that these groups can continue to make informed decisions. As new technologies change how people interact and firms do business, the Commerce Department will continue to innovate the data we provide to measure the evolving economy. This blog was cross posted on the Economics & Statistics Administration blog .